So you might have seen 3G being advertised everywhere these days, billboards, television advertisements, you name it. But what is 3G? How is it different from what we used previously? What were the previous standards? First of all, these standards are set by the International Telecommunication Union or ITU for short. It is a specialized agency of the United Nations, founded in 1865, which is responsible for information and communication technologies. The ITU co-ordinates the shared global use of the radio spectrum, works to improve telecommunication infrastructure and establishes related worldwide telecommunication standards. It all started with 1G, the first generation of wireless telephone technology and mobile telecommunications. Introduced sometime in the 1980’s, 1G networks used analog signals, as opposed to digital signals used by all the successive generations of mobile technologies. In 1G network, voice calls were simply modulated to a higher frequency, typically to 150MHz and up. The first commercially available cellular network using 1G standard was introduced by NTT (Nippon Telegraph and Telephone) in 1979 in Japan. NTT is also a shareholder and technology provider for TATA DoCoMo in India. The second generation, 2G, was commercially launched for the GSM standard in 1991 by Radiolinja, currently known as Elisa Oyj, in Finland. 2G allowed for enhanced data services and also introduced short messaging service (SMS). Since the introduction of 2G, voice communications were digitally encrypted. This allowed for greater privacy, efficient data transfer and also less expensive equipment. Two revisions or additions to this generation are sometimes referred to 2.5G and 2.75G. The combined introduction of GPRS (General Packet Radio Services) and the usage of CDMAone networks collectively came to be known as 2.5G. GPRS provided data transfer rates from 56-115kbit/s. So, services like WAP (Wireless Application Protocol) and MMS (Multimedia Messaging) were introduced, along with Internet services. 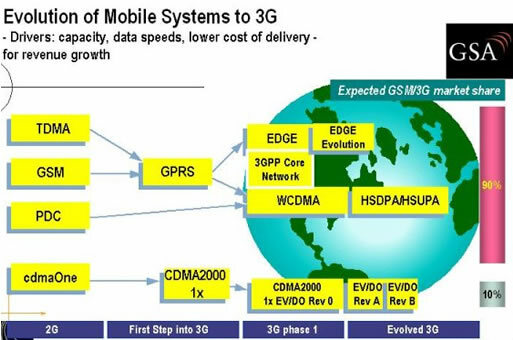 2.75G was the name given to the evolution of EDGE (Enhanced Data rates for GSM Evolution) or Enhanced GPRS (EGPRS). This was due to the introduction of 8PSK encoding, which facilitated higher data transfer rates of up to 236.8kbits/s, almost triple of the previous rates. This is the most widely used generation of mobile telecommunication networks, and is what most mobile phones in India are now using. The third generation, 3G, was introduced by NTT DoCoMo in Japan, in 2001. Although initially limited in scope, it was a leap forward. 3G used completely different radio frequencies from 2G, so it required different equipment to achieve the new high data transfer rates. Also, the enormous costs of additional spectrum licensing fees delayed the introduction of 3G in many countries. 3G data transfer rates are 384kbits/s to 2Mbits/s, so it allows for previously unavailable services like video calls, video conferencing, online conference call, mobile TV, online gaming etc. These speeds are broadband equivalent, so the applications and capabilities are enhanced greatly. Along with these services, 3G provides greater security and privacy. As with 2G, minor evolution of the standards resulted in 3.5G and 3.75G. Again, these standards allowed for higher data transfer rates, exceeding 2Mbits/s, reaching about 14Mbits/s. The next generation, 4G mobile phones are all set to provide data transfer rates of 100Mbit/s to 1Gbit/s, which is mind boggling, to say the least. Such speeds are not even present in wired networks commercially. 3G has just been launched in India and is available on select mobile operators for select cities. But to access these services, a 3G compatible mobile phone is required. Very informative…! Thanks for sharing..! Most important thing that I should mention without fail is the simplicity at which the information is shared. Looking forward to more of such information. Transfer data over this devices much better, and navigate over the web easily than the precedent technologies. Limited but nicely explained. Do share any such informative notes on wireless Generation. The information here is really helpful and quite revealing. Your work is also quite inspiring. Keep it up, more power to your elbow. why Japan Total Access Communications System did not include in 1st G? I did mention the NTT (Nippon Telegraph and Telecom) 1G network. The Total Access Communications System was an alternate name for the commercially used version of the same.